1 great project in 2 great days for 7 Directions Architects! Last Fall I had the pleasure of fielding a call about photographing the new Skokomish Tribal Community Center for Daniel J. Glenn, AIA, AICAE. Daniel is the Principal Architect of 7 Directions Architects/Planners, a Native American-owned firm based in Seattle, Washington, specializing in culturally and environmentally responsive architecture and planning. He was close to officially turning over the keys to the community center to the owners, the Skokomish Indian Tribe, and needed architectural photography for a pair of upcoming book projects: Our Voices: Indigeneity and Architecture and The Handbook of Contemporary Indigenous Architecture. He is a contributing author to both and co-editor of the Handbook. Image deadlines were looming so we needed to strike right away! Architectural photographer's need to learn as much as possible about the program of each building to be successful. And so we chatted at length about his project, what was unique, best angles, key features of the design, and why! As we talked I learned there is a rich and deep process to his design. As shared in his book Our Voices: Indigeneity and Architecture, "With each Tribe, we seek to design for the Seven Generations: three generations of the ancestors, the present generation, and three generations into the future. Through the Elders, both those who are still with us and those who have passed, we seek to learn about the traditions, the history and the culture of the people and the place. We analyze their architectural and design traditions." The East elevation of the new Skokomish Tribal Community Center located in Skokomish, Washington. During the first of two visits the primary focus was on exteriors elevations. How it plays with the environment. So I headed out at 3:30am the next day to ensure I ready to shoot at dawn's first light. Fortunately the deteriorating weather held off and I came back with 5 beautiful images throughout daybreak. Following the post production artwork I shared the images and met his deadline. The success of any project relies on customer satisfaction. HIs reply? I am happy to report these images have secured a prominent place in both books and a also a place of honor amongst his ongoing marketing and publishing efforts. The structure reflects enormous linear cedar plank houses that once lined the coasts of Puget Sound and celebrates the building tradition of the Skokomish people.Nestled against a forested backdrop, this space features an extensive array of Solar cells, also called photovoltaic (PV) cells, bringing energy from the sun, its air to air heat exchangers drawing energy from the air, and its structural insulated panels providing a super insulated building envelope, and is on track to be the first Net Zero project on tribal land in the United States. The Ceremonial East entry to the gathering space with welcome figure details. Earlier this year Daniel had me back for a second day to photograph the the interiors spaces. I arrived to a torrential downpour, many inches per hour, and so was faced with that task of offloading gear beneath the eaves escaping the deluge by mere inches. 😬 With a solid plan in hand I worked each space determining best perspectives and coaxing the natural light working through the space. I often need to augment forms and surfaces with supplemental lighting to kick off shape and texture but found less intrusion to best showcase the peace, reverence and solitude of this great space. I was met with a wondrous scent of cedar as I worked throughout the day. Ahh. The best laid plans...the second day not quite as idyllic as the first! Such is architectural photography in the Pacific Northwest! These stunning interior spaces were designed by Kimberly Deriana, Architectural Designer at 7 Directions Architects/Planners. Her design elements married traditional Coast Salish artwork with solid functionality throughout, matching the beauty and grace of the exterior structure in its natural settings! 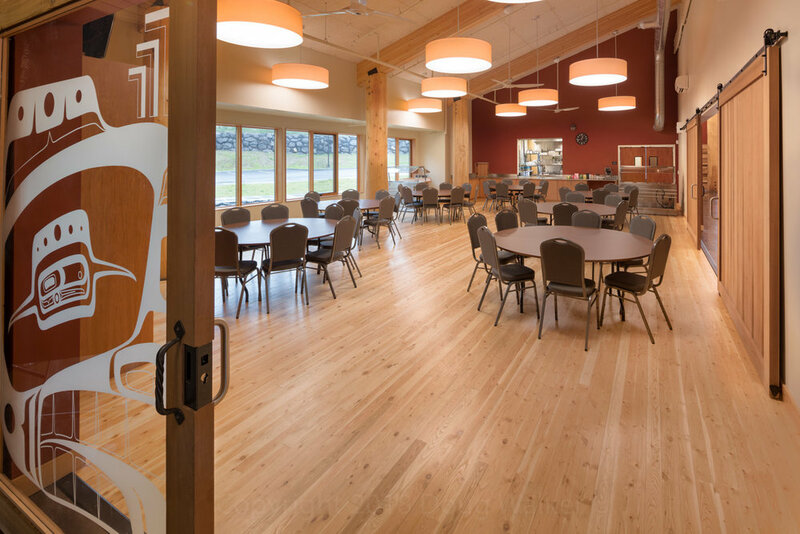 This image of The Skokomish Tribal Community Center's gathering space was featured in AZURE Magazine’s piece titled UNCEDED IS CANADA’S EXPLORATION OF INDIGENOUS ARCHITECTURE. This is a glorious tall space, with cedar wrapped clerestory windows and large circular lamps giving a sense of daylight. 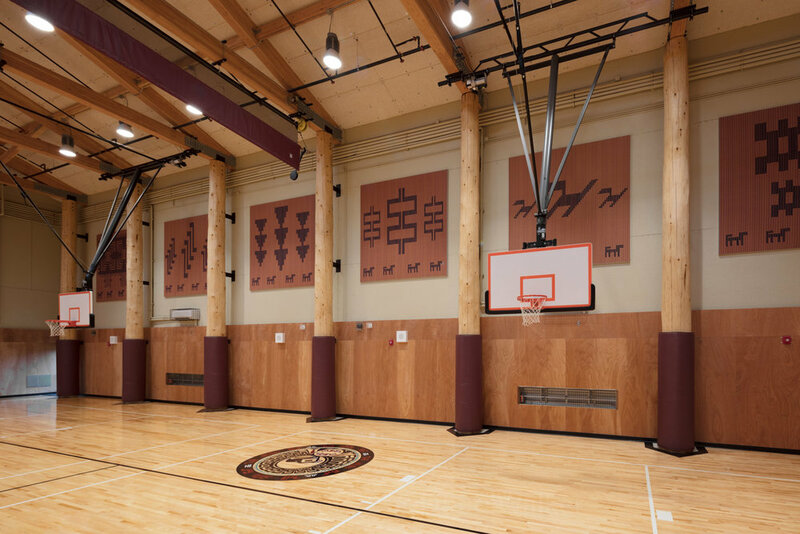 The materials and artwork used throughout the Tribal Community Center reflect an environmentally responsive architecture and planning. Working in concert with other built-community members 'Malsam Tsang Structural Engineering', 'SCJ Alliance', 'Travis, Fitzmaurice & Associates', 'Ecotope', 'Pease Construction', 'Capital Heating and Cooling', and 'Solar Washington' the results stand testament to solid partnering. Large carved wood doors feature Skokomish artwork created by Skokomish artists John Edward Smith and Derek Grover. These doors separate the gathering space from the main entry space. Hearty congratulations to Daniel Glenn who is part of a team of indigenous architects presenting at the 2018 Venice Biennale. Unceded: Voices of the Land is Canada’s official entry showcasing a team of 18 all indigenous architects. The exhibit explores and seeks to understand what contemporary architecture is in THIS age. This exhibit celebrates the voices of these indigenous architects through their design and architecture. These beautiful carved doors feature traditional Coast Salish artwork. A view through to the Gathering Space provides a sense of depth and scale. A tournament size gymnasium serves to bring regional tournaments and communities together during holidays, funerals, and large cultural celebrations. North-side elevation l-r. East entry, gathering space, Elder's area, main entry and lobby and lastly the gymnasium. Beautiful glass and cedar doors with Skokomish artwork invite visitors into the Elders Area. Sporting a full kitchen deep space with doors to Gathering Space to the right. A gorgeous dawn image of the East entrance featuring house welcoming figures and house posts and Skokomish artwork welcoming figures . As an architectural photographer I am often working large municipal projects in bustling cities with complex traffic, access, security and logistic issues. It was such a joy to work a space such as this. Having grown up in South Puget Sound I've been raised on water and trees. The serenity of this peaceful setting recharged my spirit. It was a truly memorable site to work. I remain honored to have been brought on as a creative partner to showcase Daniel's design. Thank you Daniel! 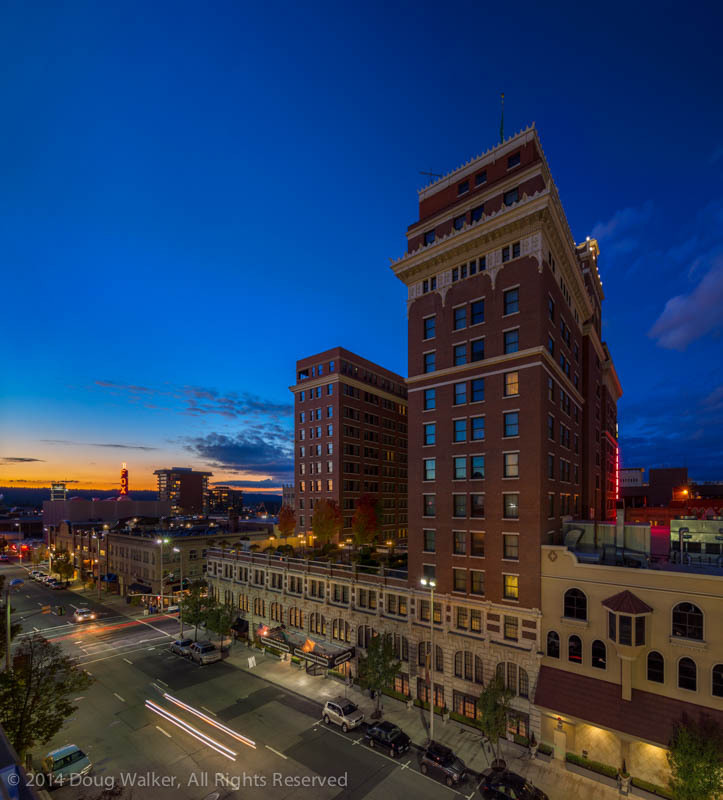 The final dusk image from our Architectural Photography Workshop presented at the Davenport Hotel in downtown Spokane, Washington. I was invited to present an Architectural Photography Workshop at the recent Professional Photographers of Washington Fall Conference held at the beautiful Davenport Hotel in downtown Spokane, Washington. Discovering the Art in Architecture! As an architectural photographer I always look forward to discovering Art in Architecture that hides in plain sight each project that I photograph. Recently I had the pleasure of working with the great folks at KMB Design Groups on capturing their newly finished Nisqually Public Safety Complex aka 'The Nisqually Jail'.